A second powerful earthquake in less than three weeks spread panic in Nepal on Tuesday, bringing down buildings weakened by the first disaster and killing at least 66 people. Landslides were reported in Himalayan valleys near Qomolangma, also known as Mount Everest in the West. Seventeen people were killed in Indian states bordering Nepal, according to officials, and one person was reported to have died in the Tibet autonomous region after rocks fell on a car. 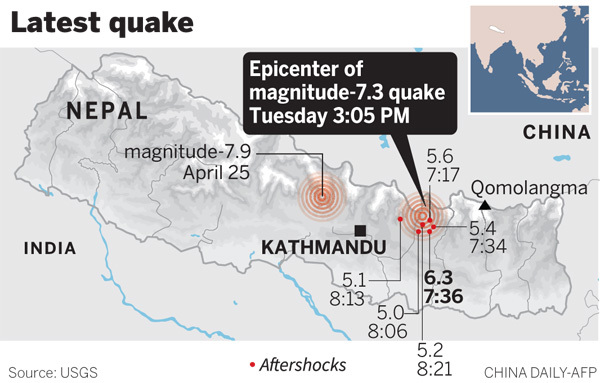 Most of the reported fatalities were in villages to the east of Kathmandu that were just beginning to recover after the magnitude-7.9 quake on April 25 that left more than 8,000 people dead. The new earthquake was centered 76 kilometers east of the capital in an area close to the border with Tibet, according to coordinates provided by the US Geological Survey. Aid workers flying over the area reported seeing serious damage to some villages, and witnesses said they saw rocks and mud crashing down remote hillsides lined with roads and small hamlets. Terrified Kathmandu residents who were too nervous to remain inside crammed into public spaces. "I am very scared, and I am with my two sons," said Rhita Doma Sherpa, a nurse at Mountain Medicine Center in Namche Bazaar. "The school building is cracked and bits of it, I can see they have collapsed. It was lunchtime. All the kids were outside, thank god." In Tibet, one woman was killed and two other people were injured by falling rocks in the township of Gyirong, Xinhua News Agency said. A border inspection officer said the dead woman, identified as Chodron, was a resident of the area. Xinhua reporters in Gyirong said landslides on both sides of the border were accompanied by loud noises. In Nepal, the districts of Dolakha and Sindhupalchowk, two of the areas worst affected by last month's quake, bore the brunt of the damage once more. "Many houses have collapsed in Dolakha and there is a chance that the number of dead from the district will go up," said Home Minister Bam Dev Gautam. The Red Cross said it had received reports of large-scale casualties in the town of Chautara in Sindhupalchowk, where its Norwegian branch is running a field hospital.